President & CEO of "Dr. Wilderness, Inc."
Khevin Barnes, best known as the creator and host of "The Dr. Wilderness Show", California's longest running touring science/ magic program, delivers compelling stories, thought provoking science and astonishing stage magic to convention and cruise ship audiences throughout Hawaii in this corporate keynote presentation. 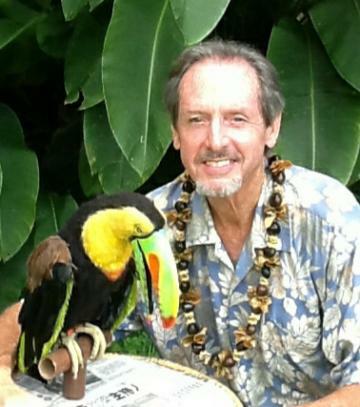 Focusing on Hawaii's incomparable natural history,Khevin brings the music, mystery and magic of the Hawaiian islands to life in a professional and highly entertaining multi-media presentation. With a long history of work for The Walt Disney Company and Legoland California, and 35 years of performances at conventions and meetings world-wide, Khevin ignites our "sense of wonder" and what he calls our "Astonishmentality" by inviting audiences to be amazed not only by the world around us, but the world inside of us. 1. "The Spirit of Aloha! Discovering the Magic of Hawaii"
2. "The History and Mystery of Imagination and Creativity"
3. "The Disney Lecture--Exploring the life and times of one of history's great creative visionaries--Walt Disney"
2,500 school presentations throughout the U.S.